Virginia Creeper is a woody vine which is considered invasive in some regions yet grown as an ornamental in others. The leaves are alternate with each leaf palmately divided (arranged in a radial pattern like fingers from a palm) with 5 (sometimes 3 or 7) leaflets. The leaves are generally long and toothed. Other names are American ivy, woodbine, and ampelopsis. This deciduous vine is hardy from zone 3 to zone 9. Interesting Fact: The sap of the Virginia Creeper contains oxalate crystals which can cause irritation and possibly skin rash. 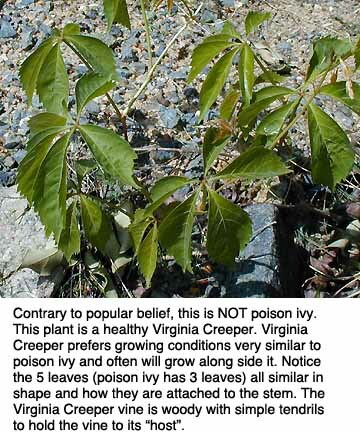 California Poison Control System - Information on toxicity of various plants including Virginia Creeper. Iowa State University Botanical Information - Contains information about plants found around the university including Virginia Creeper.